After installing Ghost Browser there two important settings you should know about, how to get a free trial and import your browser settings. Your initial download of Ghost Browser includes the ability to activate a fully featured two-week premium trial with no credit card required. This gives you access to all of the premium features absolutely free for 14 days. You may upgrade to a premium plan at any time during the 14 days of your free trial. After installing the browser enter a valid email address on the startup page. One-time use email domains like mailinator are disabled so please enter an actual email address where you can confirm the signup. You will be added to two lists. One is our educational series from which you can unsubscribe at any time. The other is a list for account related issues. We highly recommend you don't unsubscribe from this but you can if you must. Please note that you get one trial per computer. If your trial does not activate, please contact us, but if you've already had one, we'll know. Using alternate email addresses or IP addresses will not beat the system. Sorry. 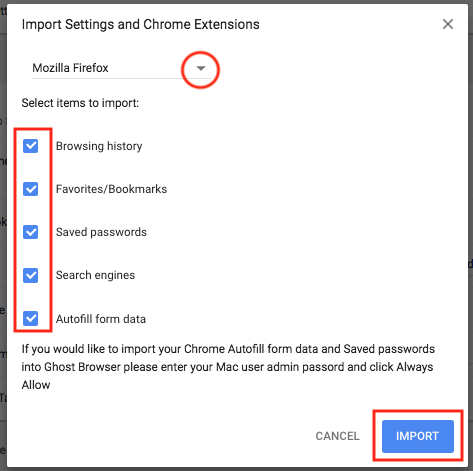 In order to help make the transition from Chrome to Ghost Browser easier, we created a tool which allows you to import your Chrome data into Ghost Browser, including your extensions! We take your privacy seriously. When you import this information into Ghost Browser, it is stored locally and is never transmitted through our servers. In Ghost Browser, click the three-dot browser menu in the upper right corner and select Import Settings and Chrome Extensions. The Import bookmarks and settings window will open. 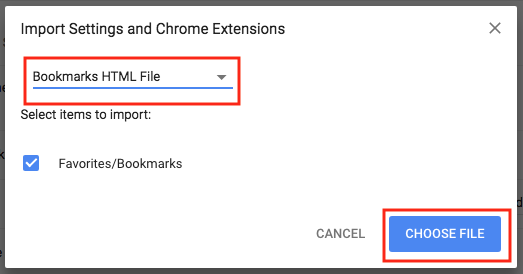 Use the drop-down menu to select the Chrome profile for which you want to import the data into Ghost Browser. 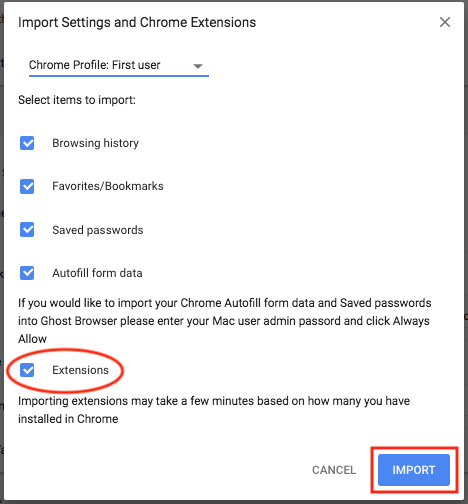 If you want to import your Chrome extensions, make sure to check the Extensions box. If you already created one bookmark before importing your bookmarks, your bookmarks from this import will all be placed in a folder called, Import. Otherwise, they'll display across the bookmarks bar as expected. If Chrome is currently open, a message appears asking you to save all work in Chrome. Once you have done this, click Force Quit and Import. If you are prompted more than twice to quit Chrome, open Chrome, and select Menu > Exit. You can easily import your Chrome, Safari, Firefox and IE browser data into Ghost Browser. If you're coming from Chrome you can even import your extensions by following the instructions above. 1. From Ghost Browser, click the three-dot browser menu in the upper right corner and select Import Settings and Chrome Extensions. The Import bookmarks and settings window will open. 2. 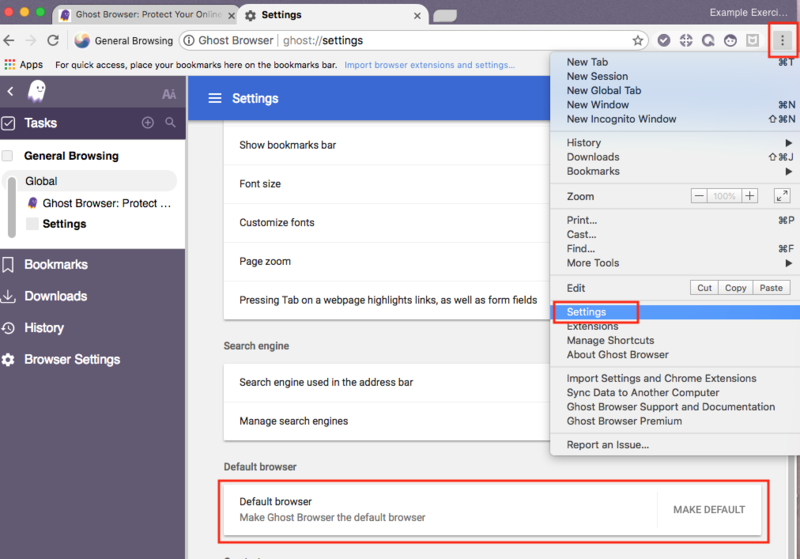 Use the From drop-down menu to select the browser for which you want to import the data into Ghost Browser. 3. Remove any checkboxes for data you do not want to import. 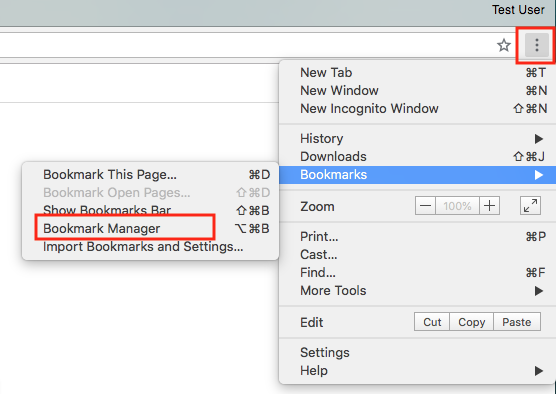 Note: If you've already created a bookmark before importing your bookmarks from another browser your imported bookmarks will be placed in a folder on the bookmarks bar. If importin from Internet Explorer, all bookmarks are placed in a folder called " Imported from IE". If importing from Firefox, all bookmarks are placed in a folder called " Imported from Firefox". You can import Chrome, Firefox, or IE bookmarks and settings as an HTML file. 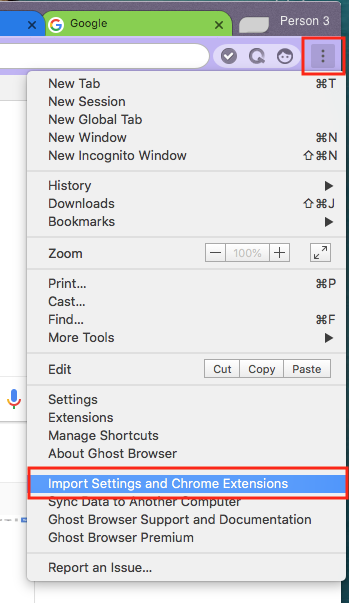 After saving your bookmarks and settings in an HTML file, you can import them into Ghost Browser. If you're importing your settings from Chrome: You can import your Chrome extensions in addition to your bookmarks and settings. If you'd like to automatically import your bookmarks, settings and Chrome extensions, please see the above instructions. 1. 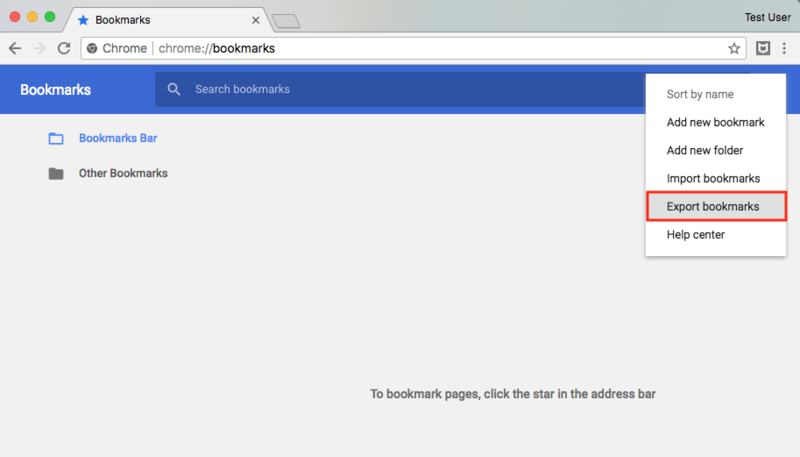 From Chrome, click the three-dot browser menu in the upper right corner of the browser and select Bookmarks > Bookmarks Manager. 2. From the Bookmark Manager window, click the three-dot menu in the blue bar and then Export bookmarks to HTML file. 3. Select a location to save the file and then click Save. Note: The default file name is "bookmarks_[today’s date].html". You can edit this name if necessary. 1. 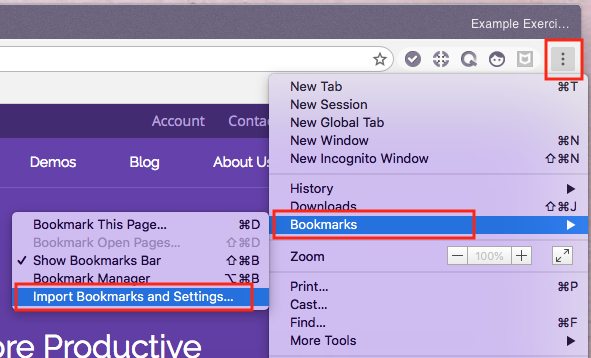 From Firefox, click the Bookmarks icon and then select Show All Bookmarks. 2. 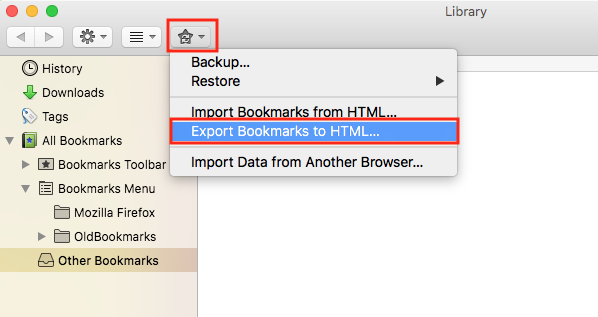 From the Library window, select Import and Backup > Export Bookmarks to HTML. Note: The default file name is bookmarks.html. You can edit this name if necessary. 1. From IE, select the Favorites icon. 2. From the menu, select Import and Export. 3. Select the Export to a file button and then click Next. 4. Select the Favorites checkbox and then click Next. 5. Select the folder from which to export your bookmarks and click Next. 6. Select a location to save the file and then click Save. Note: The default file name is bookmark.htm. You can edit this name if necessary. After you have created the HTML file, you can import it into Ghost Browser. 1. From Ghost Browser, click the three-dot browser menu in the upper right corner of the browser and select Bookmarks > Import bookmarks and settings. 2. From the Import bookmarks and settings window, select Bookmarks HTML File using the "From" menu. 3. Click Choose File and navigate to the saved HTML file. 4. Click Open. After the HTML file has been imported to Ghost Browser, a Success message appears. 5. Click Done to close the Success message. We think it’s a great idea if you want to make Ghost Browser your default browser! You’ll see a serious boost in productivity and making Ghost Browser your default browser is easy. 1. From Ghost Browser, click the three-dot browser menu in the upper right corner of the browser and select Settings. Note: macOS users also have the option of selecting Preferences from the Ghost Browser menu at the top of your screen. 2. At the bottom of the Settings page, click Make Ghost Browser the default browser. 3. Click Yes if a message appears. Ghost Browser works just like Chrome when installing extensions. Just open Ghost Browser and navigate to the Chrome store, and install any extension you want. It’s that easy!